DEARBORN, Mich. (AP) — Ford Motor Co. said Tuesday it earned $2.1 billion in the first quarter, another sign the economy is improving as people spend more on big-ticket items like cars. The automaker expects to be solidly profitable this year, a year earlier than its previous guidance. Ford said its net income per share was 50 cents for the quarter. That's an about-face from the same period last year when it lost $1.4 billion, or 60 cents per share, at the height of the recession. It was Ford's fourth straight positive quarter and its highest quarterly profit in six years. Ford, the only Detroit-area automaker to shun government aid and stay out of bankruptcy protection last year, gained market share from crosstown rivals General Motors Co. and Chrysler Group LLC. It also benefited from Toyota Motor Corp.'s safety recalls of millions of vehicles. Ford was one of the top brands considered by Toyota owners who were shopping for a new car, Kelley Blue Book said. In a sign of its confidence in the economic recovery, Ford said it's boosting North American production in the second quarter to 625,000 vehicles, a 9 percent increase over first-quarter levels. The increase could mean additional hiring by Ford, but Chief Financial Officer Lewis Booth said Tuesday it's too early to say if the company will be adding workers. "If we continue to grow, maybe we'll talk about that sometime later," Booth said. The company was profitable in its key North American market, but it also made money in Asia, South America and Europe. In the U.S., it saw strong sales of the F-150 pickup and Ford Fusion sedan, while the new Fiesta small car sold well in Asia. Booth said the company is seeing some economic recovery, especially in the U.S., but the recovery isn't exceeding Ford's earlier prediction of 11.5 million to 12.5 million in total U.S. sales for the year. That would be up from 10.4 million in 2009 but far below sales of more than 16 million five years ago. "It's not running ahead of our expectations, but it is coming along roughly with our expectations," Booth said. Ford's first-quarter revenue rose 15 percent to $28.1 billion. Ford reported a one-time gain of $188 million related to the sale of its Volvo brand to Geely Holding Group, which was completed at the end of March. 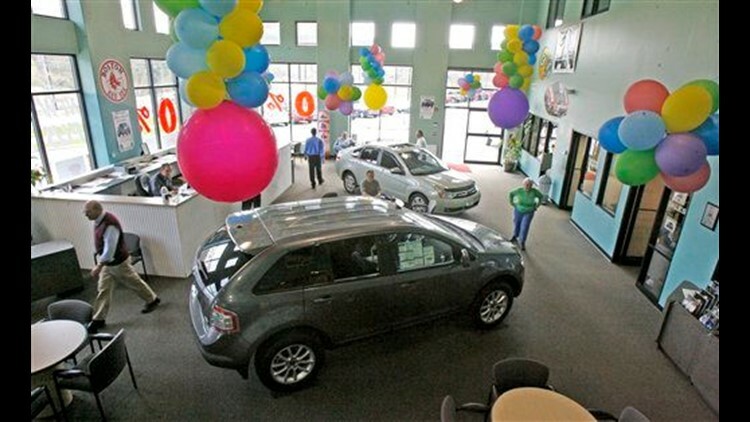 That was offset by a $63 million loss from personnel reductions and dealer payments. Ford is no longer including Volvo in its results, but said the unit would have recorded a $49 million profit for the quarter. Excluding items, Ford reported a pretax operating profit of 46 cents a share. Analysts polled by Thomson Reuters had expected revenue of $30.5 billion and a profit of 31 cents per share. Analysts typically don't account for one-time items. Ford's U.S. sales climbed 37 percent for the quarter and its market share rose nearly three percentage points. The company made $1.2 billion in North America, which had been draining cash in prior years. It also reported an 84 percent sales increase in China. Booth said the company's quarterly performance might not be duplicated later in the year. He said Ford's credit unit had a particularly strong performance, with a net profit of $528 million, and he also expects increased commodity prices and expenses for launching new vehicles later this year. But he said Ford would be more profitable for the year than it was at the end of the first quarter. Booth said Ford's sale price per vehicle was flat between the fourth quarter and the first quarter, despite big incentives offered in the first quarter by Toyota. He expects Ford to see pricing gains in the remainder of the year. Ford has gradually cut costs and improved sales since the depths of the recession a year ago. Ford made $2.7 billion last year. But the company remains saddled with significant debt. Ford said its debt increased by $700 million to $34.3 billion in the quarter. Booth said the company will continue to work on lowering its debt load. Ford paid off $3 billion in debt at the beginning of this month.